Vanessa has been a familiar face around the Hanover Veterinary Hospital and the Walkerton-Hanover Veterinary Clinic for many years in a variety of roles starting with her high school co-op placement. It was during this time that Vanessa discovered her love of Veterinary medicine and decided to pursue a career in this field. 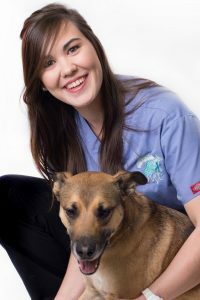 In 2014 Vanessa received her certificate in Veterinary Office Administration from the University of Guelph’s Ridgetown campus. From there she went on to complete the Veterinary Technician program at Northern College and successfully passed the Veterinary Technician National Exam (VTNE) in the spring of 2017. Vanessa then returned to a full time position at the Walkerton-Hanover Veterinary Clinic and the Hanover Veterinary Hospital as an RVT where she enjoys the variety of working with both large and small animals. Outside of work Vanessa enjoys spending time with family, friends, and walking her dog Axel that she adopted from school.